Near the entrance inside Solitude, on the right. 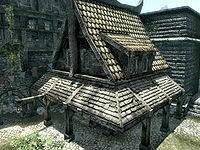 Radiant Raiment is a clothing store run by Taarie and her sister Endarie, situated on the right as you enter Solitude through the main gate. It sells various clothing of all types and expenses. It is situated next door to Bits and Pieces, opposite The Winking Skeever. The entrance is adept locked out of hours, both Endarie and Taarie carry copies of the key. When entering there is a wooden bench against the east wall and opposite against the west wall is a small wardrobe containing fine clothes and having a snow fox pelt on top. The ceiling is vaulted and has a central pillar supporting it. As the room opens up there is a narrow table with a basket containing two bunches of lavender on it, against the east wall, with another wooden bench to the right of the table. The counter is in front of the south wall and extends two thirds of the way across the shop. Against the west wall, around the corner from the entrance are double doors leading to the residence, with a small round table to the left of it, this has a plate of bread and cheese on top and another wooden bench to the left of that with a hide helmet on a ledge above it. In front of the counter is an open crate containing two bunches of tundra cotton. On the counter, the cupboard against the south wall behind it and two small sets of shelves in the southwest corner are several pieces of clothing, fine clothing, boots and a circlet that are displayed merchandise and a silver and sapphire circlet that isn't. On a ledge above the counter is an iron helmet. Behind the counter to the east is an alcove with two sets of shelves and two pieces of firewood in a basket, the smaller set of shelves holds a sabre cat pelt, a goat hide and a woodcutter's axe, while the large set has a master locked strongbox, various pieces of displayed merchandise, two jade and sapphire circlets and a goat hide. Under the counter is an iron dagger and woodcutter's axe. Through the double doors is a large dining and cooking area, with a wooden bench along the south wall with a small table at the end of it. Opposite the doors is a low table and chair with a flute, a common book and a plate filled with loaves of bread, an eidar cheese wedge and a tomato on the table. Against the north wall is a cooking pot on a stand with a small cupboard holding a platter filled with a sweet roll, two baked potatoes, a raw rabbit leg, a pheasant breast and a couple of pieces of cheese to the left and to the right is a long wooden table and bench laid for two, with two portions of grilled leeks, two seared slaughterfish, a loaf of bread, a couple of wheels of cheese, a potion of regeneration and a bunch of tundra cotton. There are wall shelves above the table holding crockery. Against the west wall is a narrow table with a bowl of bread and a plate holding a sliced eidar cheese, with an iron dagger. Above this is a wall shelf holding a bottle of alto wine and two bottles of Nord mead. To the south is a stairwell with a flight leading up to the top floor and one down to the cellar. At the top of the stairs is a T-shaped landing with three doors, one to the west, one to the north and one to the east. On the landing, either side of the door to the north is on one side, a narrow table with a basket containing a bunch of lavender and on the other, a small cupboard with a goblet and jug on top. The north wall to the left of the east door has two bookcases against it, these hold fourteen common books, a solution of strength and a potion of extreme stamina, while opposite against the south wall is a wooden bench with a small table holding another common book beside it. The door to the west opens into a bedroom that contains a single bed in the northwest corner with a small table beside it, a wardrobe against the east wall containing fine clothes and small wardrobe against the south wall with shelves above it. There is a bottle of alto wine, a bowl of bread, a plate holding a sliced eidar cheese and an iron dagger. The door to the north opens into another bedroom, this one has a partition wall coming out from the north wall. The bed is on the west side of this wall with a small table beside the bed and an open crate at the foot of it containing a bunch of lavender. There is also a tall wardrobe against the west wall with a drum beside it. The other half of the room has a tall wardrobe against the partition wall, and unlocked chest against the north wall, a cupboard against the east wall with a jug and goblet on top, with a large round wooden table to the right of it, on this table is the business ledger, a thistle branch and a plate of red and green apples. There is also a small table against the south wall with a bowl containing a medium coin purse on it. The door to the east opens into the largest bedroom with a large double bed coming out from the northeast corner with a small table on the right holding a bottle of alto wine. There are several wall shelves above the bed holding fine clothes and a small coin purse. In the northwest corner is a tall wardrobe, with a small set of shelves to the left, against the west wall, these hold two bottles of frostbite venom, two samples of slaughterfish scales, a bowl of glow dust, a deathbell flower and a potion of haggling. There is a washbasin to the left of the shelves. In the southeast corner is a small wardrobe with a large coin purse and a copy of Fall of the Snow Prince on top and a basket beside it containing two bunches of lavender. In front of this is a low table and chair, with a bottle of wine, a plate of bread and cheese and a goblet on the table. Against the south wall is a narrow table with a bowl of bread and a plate holding a sliced eidar cheese on top. Descending the stair to the cellar, it is heavily vaulted with a cupboard against the west wall holding loaves of bread, potatoes and several pieces of cheese, to the right of this is a rack with a garlic braid, two bunches of dried elves ear and a bunch of dried frost mirriam hanging from it. Against the north wall is a square wooden table with a couple of empty wine bottles and a common book on it, while in an alcove to the east is a long wooden table with a thistle branch, a leek, a bunch of elves ear and a deathbell flower on top, a stack of food barrels beside it and an unlocked chest underneath. This is the merchandise found in Radiant Raiment's merchant chest. These items are only available if purchased from the merchant; they cannot be pickpocketed or stolen. They are restocked every two days. This store has the largest inventory of enchanted jewelry in Skyrim, making it a useful stop if you are searching for a particular enchantment to add to your repertoire. Sometimes Endarie will accuse you of trespassing in the Radiant Raiment between 8am and 8pm. This seems related to disposition towards ServicesSolitudeRadiantRaiments or SolitudeRadiantRaimentsFaction. Doing a favor for Taarie or wearing Radiant Raiment fine clothes (or other fine clothes) and exiting and re-entering may help. You can't interact with either of the goat hides in the shop.